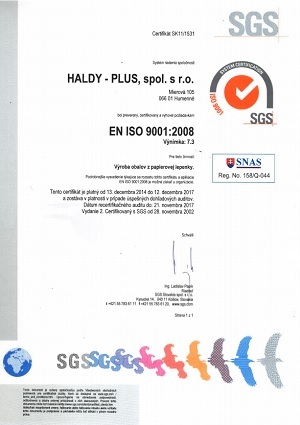 Company HALDY – PLUS, ltd., acts on market with packaging materials since 2001 through overtaking of partly production from HALDY collective, what have worked in this sphere since 1992. Our motive power are our employees, which are flexible, orientate to customer and with ability of continously education. Basicly we acts in production of packaging from corrugated cardboard 2, 3, 5 a 7 – plyed. Technologically accessories of company meets all requirements of customers, from samples production to unit and mass production, with possibility of multicoloured printing. Packaging are produced in different modifications – from basic simples types to special construction with help of modern technologies so named slotter way and flat way, or rotating cutting shape. Continously modernisation of production technologies secures to customer the best quality and wide scale of packagings, appropriet for handling with any kind of freights and for company possibility of production scale extension. Since 2002 operate company also with solid board to 1200 g/m2. At this time has company at disposal 1 450 m2 production and 4 500 m2 warehouse areas. Large storage accomodation and well operating own and contract transport services allows prodution and deliveries in short-time dates with minimum storage demands for customer ( KAN-BAN system ). Together with increasing demands for quality of products our company make efforts for increasing quality of company processes through softwares with whole company effectivity – it is appliction of information system Prodirect for handling complete company business in production of packaging and cartonage, also with system of continual improvement 6S. At production of cardboard is used about 70% raw material from waste paper, our products are after using recycable again. All the materials input in production process are hygienically and ecologically harmless, we are using certified water diluted glues, flexographic printing colours and varnishes. For separation of residual colours in waste water is used automatically equipment SEPARFLEX. What confirm also our orientation to customer demands is obtain of certification system of quality mangaging EN ISO 9001:2008, what we have get in year 2002. In year 2008 company received prestigious award GOLDPACK for the best package of the year in category of protoypes and function module, for proposal of box for packaging of WiFi antennas.